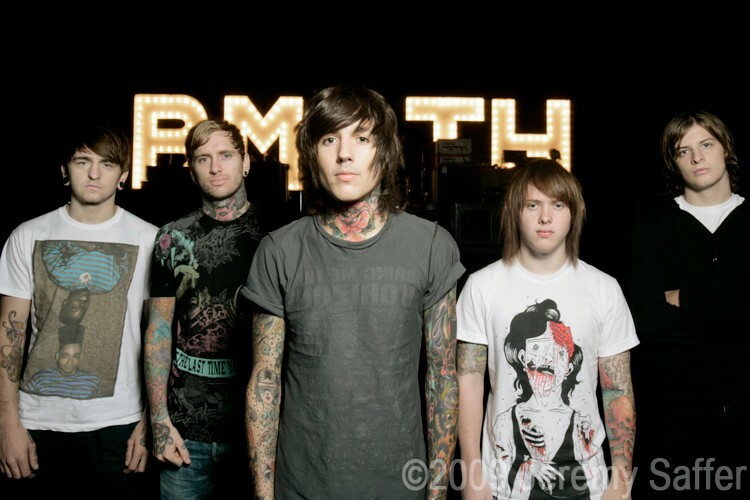 Bring Me the Horizon are a British metalcore band from Sheffield, Yorkshire. Formed in 2004, the group consists of lead vocalist Oliver Sykes, lead guitarist Lee Malia, rhythm guitarist Jona Weinhofen, bassist Matt Kean and drummer Matt Nicholls. They are currently signed to RCA in the UK, Epitaph Records in the US and to Shock Records in Australia. Their music has been said to be influenced diversely by grindcore, death metal and emo. While their earlier work is noted for its strong influence from American metalcore bands, they started to adopt a more electic style of metalcore in future releases. They have released three studio albums and one extended play. The band released their debut album Count Your Blessings on 30 October 2006 in the UK. Their second album, Suicide Season was released 29 September 2008, while a remix of the album titled Suicide Season: Cut Up! was released a year later in November. Prior to the release of the special edition of Suicide Season: Cut Up!, founding rhythm guitarist Curtis Ward left the band due to commitment issues. He was later replaced with Jona Weinhofen, formerly of I Killed the Prom Queen. Bring Me the Horizon's third studio album There Is a Hell, Believe Me I've Seen It. There Is a Heaven, Let's Keep It a Secret. was released 4 October 2010.